Another good Field Day on the books. As with previous years, we ran equipment circa 1930s vintage. The receiver was a HRO-5 and the transmitter was a homebrew wooden rack outfit with a 89-42-802 exciter and PP 814 amplifier giving about 200-250W output. Different this year was our effort to make some 630M QSOs. 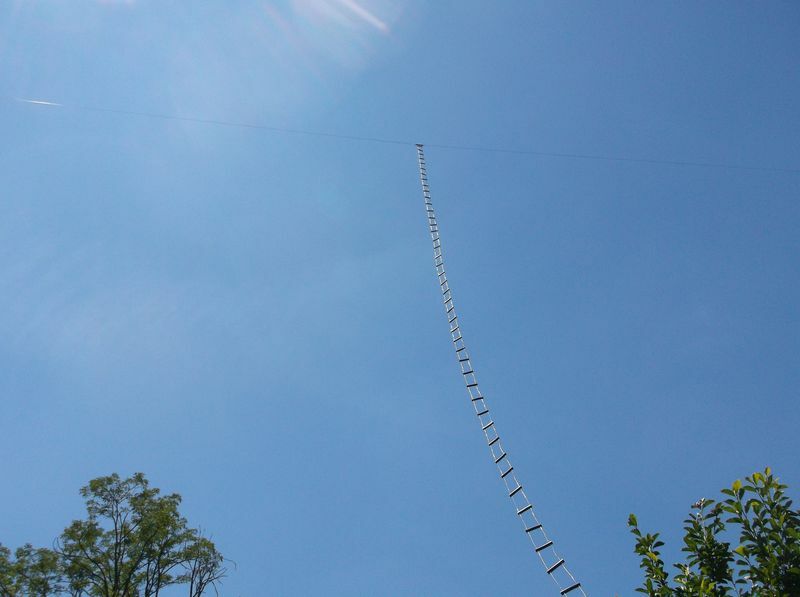 The 80M open-wire fed doublet was put into service as a Marconi vertical with the ladder line shorted at the transmitter end. 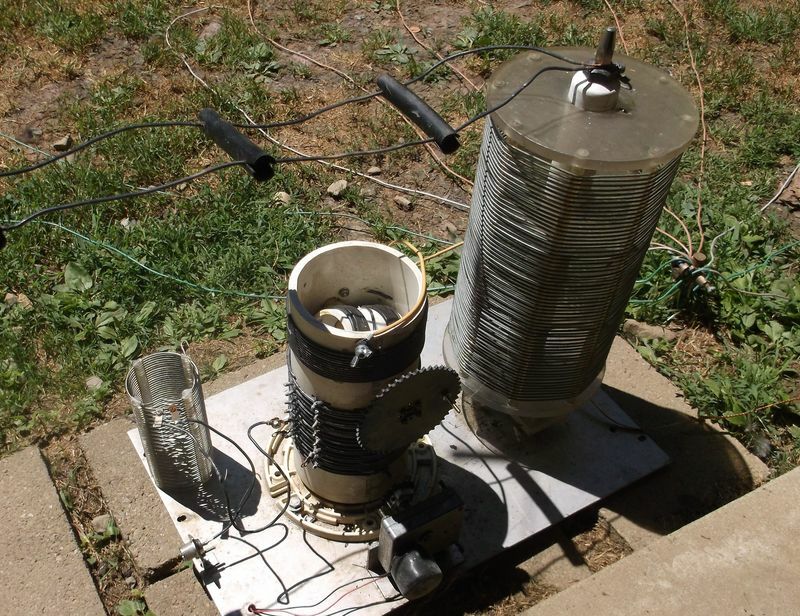 A variometer and shunt coil were used for resonance and impedance matching, respectively. A simple radial system consisting of ten approx. 70 ft long wires were laid out. They were quite effective, bringing the feedpoint resistance down from about 150 ohms with just a single ground rod to around 30 ohms. Even then, the overall efficiency was estimated to be near 1%. The 250W produced by the PP 814s resulted in about 5W EIRP. Things didn’t look too promising at first, but with patience, cooperating QSB and QRN, and a great set of ears, Mike / WA3TTS, completed a CW QSO with K3MF on 630M! It was a great moment! Later in the evening, another QSO was made with K9KFR via CW with Eric / NO3M on the key. Thanks to Mike / WA3TTS, Mark (radio enthusiast), Bob / W3BBO, Neil / W3CUV, and the ARRL group for coming and making it a fun and memorable event! 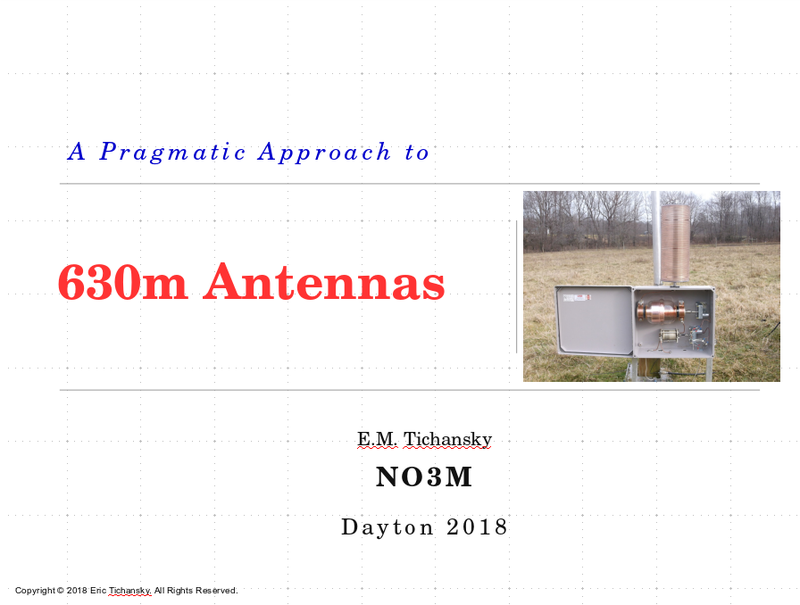 A presentation about 630m antennas at the 2018 Dayton Hamvention Antenna Forum on Friday, May 18, at 2:45 PM EDT. The material covers both transmit and receive antennas. 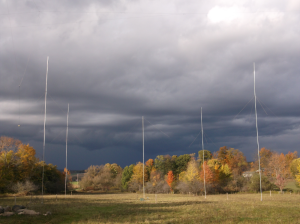 Hopefully it will inspire more operators to put 630m stations on the air. Thanks to K3LR for the invitation. The original PP 814 transmitter used for Field Day this year has been rebuilt into a 6ft wooden rack with new power supplies and some changes to the RF sections. The amplifier’s HV supply now uses a recently acquired UTC S-48 transformer (refinished in gloss black with a wrinkled top plate) with taps for 1kV, 1.25kV, and 1.5kV. These taps can be selected via banana jacks/plugs on a strip of bakelite between the transformer and the 866 mercury vapor rectifiers. There are additional supplies for the filaments (6.3VAC and 10 VAC), the oscillator and doubler (75V and 225V regulated), buffer (600V using 816 mercury vapor rectifiers), amplifier screen (300V using 816s), and amplifier bias (-90V regulated with a 874), all of which, including the HV supply, populate the lower four decks. The exciter was modified from it’s FD configuration, now using an 89 ECO oscillator choke coupled to a 42 Class A buffer (plate tuned to second harmonic of ECO grid) followed by an 802 buffer/driver. Operation is much more stable than with the original two-stage circuit. The amplifier now uses a pair of 814s in push-pull, providing more output power than the original PP 804s. The antenna tuner is also being physically reconfigured, putting the RF current meter in the center of the panel and the tuning capacitors on either side, similar to many period tuners. The circuit itself is unchanged. The plan is to operate it Field Day style from the back porch in the PA QSO Party (SOLP CW only – Crawford Co.) and well as on 630M Sunday night (0000Z Monday), which is the first day of Amateur operations on the band for most stations.